amphora, ancient vessel form used as a storage jar and one of the principal vessel shapes in Greek pottery, a two-handled pot with a neck narrower than the body. 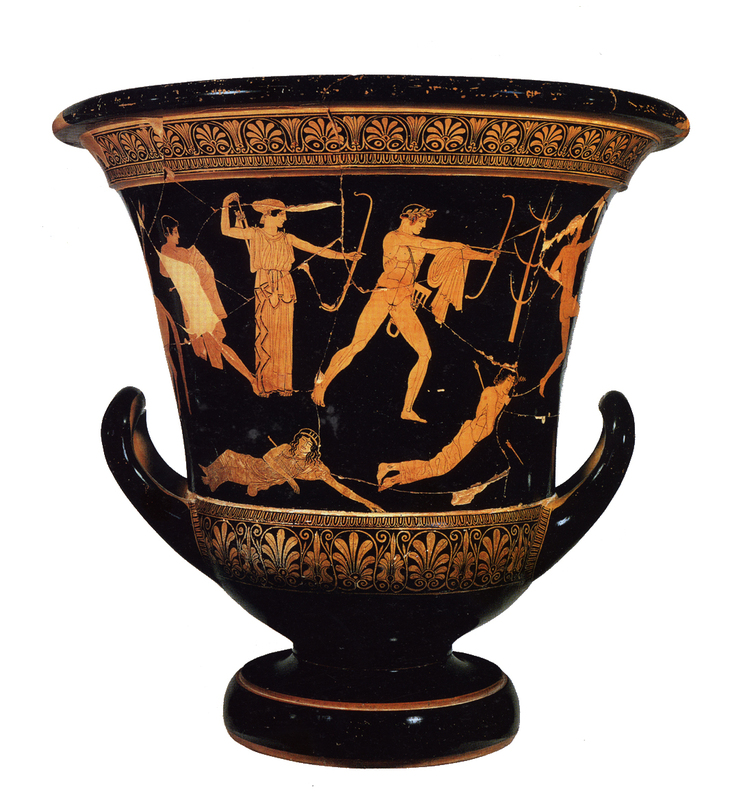 There are two types of amphora: the neck amphora, in which the neck meets the body at a sharp angle; and the one-piece amphora, in which the neck and body form a continuous curve. The first is common from the Geometric period (c.900 bc) to the decline of Greek pottery; the second appeared in the 7th century bc. 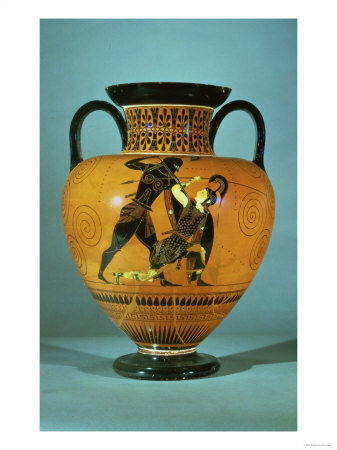 The height of amphorae varies from large Geometric vases of 5 feet (1.5 metres) to examples of 12 inches (30 centimetres) or even smaller (the smallest are called amphoriskoi). The average normal height is about 18 inches (45 centimetres). Amphorae, which survive in great numbers, were used as storage and transport vessels for olives, cereal, oil, and wine (the wine amphora was a standard Attic measure of about 41 quarts [39 litres]) and, in outsize form, for funerals and as grave markers. Wide-mouthed, painted amphorae were used as decanters and were given as prizes. I really like the first one. It looks like what you would think Greek jars would look like. both are very detailed and cool. I love the emotions that are displayed in the pottery as the pictures describe a story. The ways of using art to express something like that, all the way back then, is so cool to me! I like how each design displays a different piece of stories from Greek times. I like how instead of just glazed a solid color these pieces tell a story. i like the paintings of the jars i thing this would be a fun project to do. I like how on the second one the handles are towards the bottom. I like the second one better because it has more details. They both are very interesting and not something you see everyday. I think these are very neat because they are different. I have always heard about them but didnt really know the story. The first looks more attractive to me. I wonder if the original amphoras where that detailed. I like the first one best because it is exactly how I thought a Greek jar would look. I like the way the handles are because it is very unique. I especially love the way the pieces are painted; it is so detailed!